Just got flagged about this precious example of doing proactive disclosure wrong. 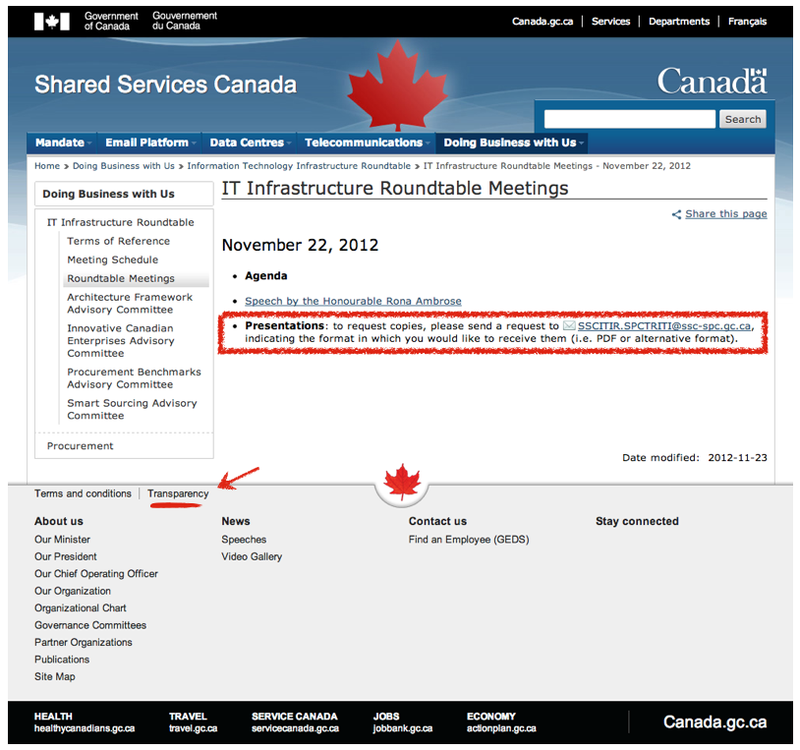 So here is a Shared Service Canada website dedicated the Roundtable on Information Technology Infrastructure. Obviously this is a topic of real interest to me – I write a fair bit about delivering (or failing to deliver) government service online effectively. I think it is great that Service Canada is reaching out to the private sector to try to learn lessons. Sadly, some of the links on the site didn’t work for me, specifically the important sounding: Summary of Discussions: Shared Services Canada Information and Communications Technology Sector Engagement Process. But that is not the best part. Take a look at the website below. In one glance the entirety of the challenge of rethinking communications and government transparency is nicely summed up. Apparently, if you want a copy of the presentation the Minister made to the committee you have to request it. That’s odd, since really, the cost of making it downloadable is essentially zero. While the cost of emailing someone and making them get it back to you, is well, a colossal waste of my, and that public servants, time. (Indeed, to demonstrate this to the government, I hope that everyone of my readers requests this document). There are, in my mind, two explanations for this. The first, more ominous one, is that someone wants to create barriers to getting this document. Maybe that is the case – who knows. The second, less ominous, but in some ways more depressing answer is that this is simply standard protocol, or worse, that no one involved in this site has the know how or access rights to upload the document. Noted added 6 mins after posting: There is also a third reason, less innocuous than reasons one and two. That being that the government cannot post the document unless it is in both official languages. And since this presentation is only available in (likely) english, it cannot be posted. This actually feels the most likely and will be teeing up a whole new post shortly on bilingualism and transparency. The number of times I’m told a document or data set can’t be proactively shared because of language issues is frustratingly frequent. I’ve spoken to the Language Commissioner on this and believe more dialogue is required. Bilingualism cannot be an excuse for a poor experience, or worse, opaque government. In either case, it is a sad outcome. 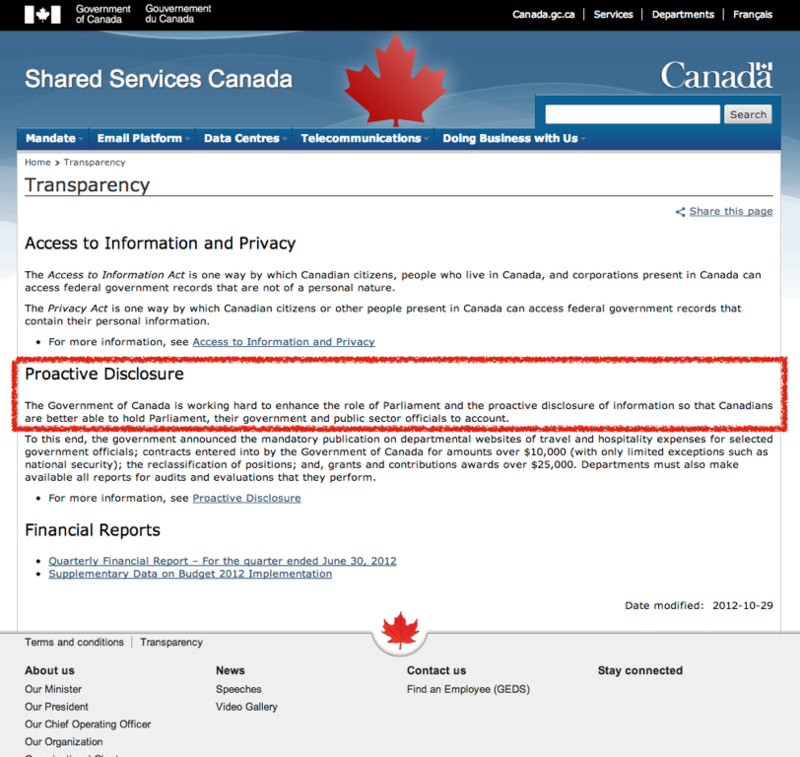 Either our government is maliciously trying to make it difficult to get information to Canadians (true of most governments) or they don’t know how to. Of course, you may be saying… but David – who cares if there is an added step to geting this document that is slightly inconvenient? Well, let me remind you THIS IS SHARED SERVICE CANADA AND IT IS ABOUT A COMMITTEE FOCUSED ON DELIVERING ONLINE SERVICES (INTERNALLY AND EXTERNALLY) MORE EFFECTIVELY. If there was one place where you wanted to show you were responsive, proactive and reducing the transaction costs to citizens… the kind of approach you were going to use to make all government service more efficient and effective… this would be it. The icing on the cake? There is that beautiful “transparency” button right below the text that talks about how the government is interested in proactive disclosure (see screenshot below). I love the text here – this is exactly what I want my government to be doing. And yet, this is experience, while I’m sure conforming to the letter of the policy, feels like it violates pretty much everything around the spirit of proactive disclosure. This is after all a document that has already been made public… and now we are requiring citizens to request it. This entry was posted in canadian politics, open data, public policy, public service sector renewal and tagged cdnpoli, CPSR, opengov, service canada on November 26, 2012 by David Eaves. Ironic, yes. Another irony: try requesting a Privacy Impact Assessment… I’m on week 8, and I’m not even sure if my request is in the right department’s hands yet… On one call I explained to the gov’t ‘information analyst’ that getting details on how my government is handling my personal information should not be this difficult. There is a difference between Shared Services Canada and Service Canada. Yes, I’ve heard a lot about problems with improving the federal Access to Information Act to require greater proactive disclosure (the direction taken by many more moden freedom of information laws) because of the implicit costs of meeting the bilingualism requirements. Needs to be sorted ASAP. The government knows how to upload docs. Do a search for powerpoints and you’ll find thousands. The fact is publishing policy compliant info is not cheap, so i suspect these people, with finite budgets, are trying to find ways of balancing the need to communicate with the need to be good stewards of the public purse. “Email me a copy” is a way of doing that. Don’t get me wrong, it’s far from optimal, but its a bone fide attempt to do more with less. I think inciting people to request this doc if they don’t need it is really asking people to waste their own money. Please note that the email request system for ITIR documents is a temporary solution until we are able to obtain and post PDF versions that meet the Government of Canada’s accessibility requirements. These will be available shortly for the November 22nd meeting and other meetings going forward. Ah yes, the “accessibility requirements.” I get this all the time. So, instead of making documents “as accessible as possible”, we’re just going to make them “equally inaccessible” for everyone, to ensure people with “accessibility issues” aren’t feeling left out. Yeah, I feel my taxpayer dollars are being well spent there.